Richard is the type of Paramedic who always serves his patients and coworkers with respect, understanding, compassion, and dignity. 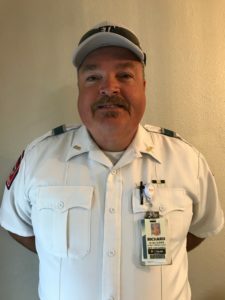 Richard started his career with ETMC EMS in December 1991, and he is still rocking the streets to this day with the same demeanor he started with. Not only has Richard touched the lives of countless patients, he has also gained countless friendships with the everyday folk he comes in contact with. His addictive humor makes it easy to get caught up in his stories, no matter how many times you’ve heard them. Richard has always been a great asset to his EMS family and deserves recognition for going above and beyond in an effort to make every day better for the future.